Peterborough thrashed Oldham in their first League One game since Dave Robertson's sacking, leading the Latics to dismiss manager Darren Kelly. 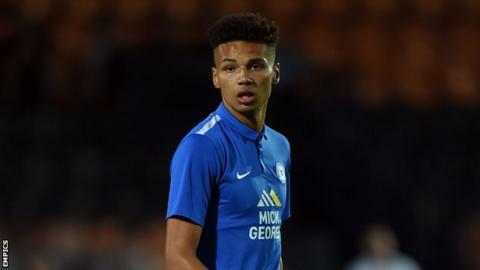 Debutant Lee Angol put Posh ahead early on when he turned home Souleymane Coulibaly's cross, before setting up Erhun Oztumer to fire home. Rhys Murphy pulled one back for the hosts, but after the break Coulibaly raced clear to finish his side's third. Coulibaly nodded in Marcus Maddison's cross and Angol slotted in the fifth. "It was a poor performance. "We were in the game for 15 to 20 minutes at the start of the second half, we got a goal back and we were on top at that stage but then we went back to thing we were doing in the first half. "We've conceded sloppy goals today and you can't win games when you concede goals as bad as we did. "We didn't play as a team." "I thought they were all superb goals - I said to the players, me being greedy, if we had believed in ourselves we could have got more, but I'll settle for that. "I didn't single anyone out in the changing room - to a man, we were exceptional. "They took the messages that I gave to them onto the pitch - they definitely expressed themselves and played with a real freedom. I thought we were very good." Match ends, Oldham Athletic 1, Peterborough United 5. Second Half ends, Oldham Athletic 1, Peterborough United 5. Attempt missed. Michael Jones (Oldham Athletic) right footed shot from outside the box is just a bit too high from a direct free kick. Rhys Murphy (Oldham Athletic) wins a free kick in the attacking half. Attempt saved. James Wilson (Oldham Athletic) right footed shot from outside the box is saved in the bottom right corner. Corner, Oldham Athletic. Conceded by Gabriel Zakuani. Corner, Oldham Athletic. Conceded by Ben Alnwick. Attempt saved. David Dunn (Oldham Athletic) right footed shot from outside the box is saved in the top centre of the goal. Substitution, Peterborough United. Leonardo Da Silva Lopes replaces Erhun Oztumer. Erhun Oztumer (Peterborough United) wins a free kick in the attacking half. Attempt saved. David Dunn (Oldham Athletic) right footed shot from long range on the left is saved in the bottom left corner. Attempt missed. Joseph Mills (Oldham Athletic) left footed shot from outside the box is close, but misses to the left from a direct free kick. David Dunn (Oldham Athletic) wins a free kick in the attacking half. Danny Philliskirk (Oldham Athletic) wins a free kick on the left wing. David Dunn (Oldham Athletic) is shown the yellow card for a bad foul. Foul by David Dunn (Oldham Athletic). Goal! Oldham Athletic 1, Peterborough United 5. Lee Angol (Peterborough United) right footed shot from the centre of the box to the bottom left corner. Assisted by Michael Smith. Substitution, Peterborough United. Jon Taylor replaces Marcus Maddison. Attempt saved. Timothee Dieng (Oldham Athletic) right footed shot from a difficult angle on the right is saved in the bottom right corner. Eoghan O'Connell (Oldham Athletic) wins a free kick in the attacking half. Foul by Eoghan O'Connell (Oldham Athletic). Corner, Oldham Athletic. Conceded by Ricardo Santos. Corner, Oldham Athletic. Conceded by Callum Elder. Attempt blocked. Dominic Poleon (Oldham Athletic) right footed shot from a difficult angle on the right is blocked. Substitution, Peterborough United. Jack Collison replaces Chris Forrester. Substitution, Oldham Athletic. Michael Jones replaces Mark Yeates. Dominic Poleon (Oldham Athletic) hits the left post with a right footed shot from the right side of the box. Attempt saved. Mark Yeates (Oldham Athletic) right footed shot from outside the box is saved in the top left corner. Mark Yeates (Oldham Athletic) wins a free kick in the defensive half. Attempt blocked. David Dunn (Oldham Athletic) right footed shot from outside the box is blocked.